Google has announced new Chrome-powered computers, which are set to target budget-conscious consumers and schools.The range includes a new type of device called the Chromebit, which looks like an oversized memory stick, and turns monitors and TVs into computers when plugged into their HDMI ports. The tech firm also revealed the cheapest Chromebook laptops to date, costing $149 (£101). The move is likely to intensify competition with Microsoft. The announcements came less than a day after Microsoft revealed plans to sell a new entry-level tablet-laptop hybrid of its own. Its Surface 3 costs more -$499, and £419 in the UK for the basic model – but provides access to a wider range of software made for the Windows platform. Google has pledged not to display ads to children that use the education-related software it provides for its Chrome platform, and does not charge manufactures to use its operating system. But one expert said the company still hoped to financially benefit in the long-term. For now, Google says the new Chromebooks and Chromebits will be limited to the US. Chrome OS runs web-based software via the firm’s Chrome browser and recently gained the ability to run a limited number of Android apps . The platform is designed to store most of its users’ files in the cloud. More than five million Chromebooks and Chromebase desktops were sold across the world last year, according to market research firm Gartner. It forecasts that figure will grow to close to eight million units this year, and 16 million in 2018. 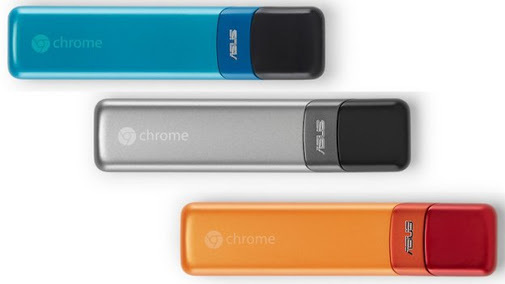 The Chromebits will be made by the Taiwanese manufacturer Asus. Google said they would cost “less than $100” and go on sale before the end of the year. The search firm has already had success with the Chromecast, a media streaming dongle with a similar form factor. In recent months both Intel and Hannspree have launched Windows-powered “PC-on-a-sticks”, albeit at a slightly higher cost. Such devices require their owners to provide displays, keyboards and other peripherals, but the idea is that many people will already own them. “People seem to love the idea of having a working computer on something no bigger than a dongle that lets them do web browsing, media streaming and other tasks on a big screen, but can be out of sight, out of mind when needed,” said Mr Green. The two new laptops have already gone on sale.The Haier Chromebook 11 is exclusive to Amazon while the Hisense Chromebook is being sold via Walmart.com. Both feature an 11.6in (29.5cm) screen and between 8.5 to 10 hours of battery life, but keep their costs low by restricting themselves to 16 gigabytes of storage and 2GB of RAM. Google also announced a slightly higher priced model, the Asus Chromebook Flip, whose touchscreen can be turned around. It will cost $249 when it goes on sale. “The [ultra low-cost] sector is still a relatively small part of the entire PC market, but is growing fast, so is important,” commented Mr de Renesse.